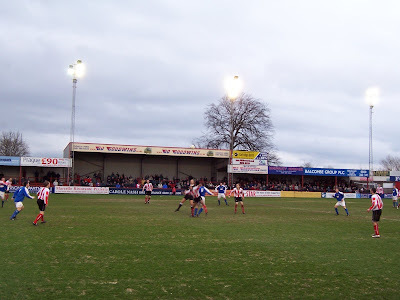 After watching Altrincham’s pretty much expected ‘giant’-killing of Leigh RMI in the prior round, I said perhaps the ticket was to follow them through to the next, as they were drawn at home to Barrow. Indeed, my first dip into the Trophy this year was to see Woodley Sports triumph over H&W’s old Southern league chums Ilkeston Town. Woodley would go out in the next round to Barrow, so I’m kinda criss-crossing the road to Villa Park, I guess. However I’m not so bothered that I wouldn’t happily miss the a round or go somewhere completely unrelated, the other factors played a part, those being a long-standing keenness to visit Moss Lane, and the fact that the crowd was likely to be fairly big and well up for it. Indeed, below the Conference, you’d be hard-pressed to find two clubs with more history and tradition than those locking horns in the Trophy 4th round today. Barrow, of course, used to be a league club losing their status in 1972 having joined from the Lancashire Combination in 1921. 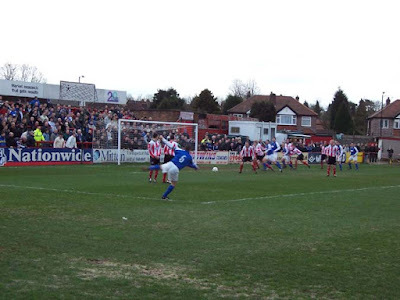 This combined with a lack of competing sporting attractions in Cumbria and a yo-yo existence between the Conference National and the Northern Premier League since their return means they top 1000 for home crowd each week, and their travelling support is welcomed by bar managers throughout the Conference North. A sizeable throng is an attendance today. 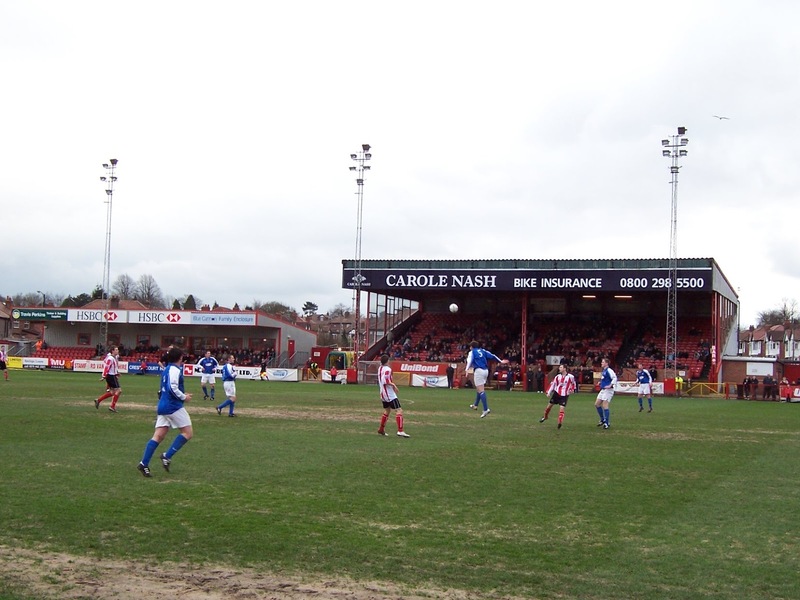 Altrincham may only average crowds of 550 at home, but they nonetheless have had great success at the top of non-league pyramid since moving up to the Northern League in 1968. They were part of the first group of clubs that formed the Alliance (later to become Conference) in 1979, winning it in the first two seasons, although sadly this was before promotion and relegation replaced the election system of accession to league status. They would stay in the top-flight of the semi-pro game for the best part of 20 years, although are now in their 5th successive season at the second level, without particularly troubling any title races. As kick-off approaches, the atmosphere is pretty buoyant and classic cup-tie, with balloons and singing aplenty. Barrow take up a great deal of their appointed end in a sea of blue shirts. Altrincham’s, amidst their balloons, are leading each other through an impressive range of songs, with their rendition of ‘ I Can’t Help Falling In Love With You’ delivered with mist on its eyelashes. Considering the myriad bastardisations of ‘Go West’ or ‘Here We Go’ that are the usual fall-back of the lazy chant-launcher, relative innovation occurs in the Alty repertoire with one number wrenching a melody and the occasional lyric from Franz Ferdinand’s ‘Matinee’. “Find me and follow me, from Altrincham to Timperley…”. There’s zeitgeist surfing a-happenin’ on the terrace steps of Moss Lane. Who would have thought? The game doesn’t quite match the build up. While the first half is pretty end to end, the pace doesn’t see any scorch-marks added to the punishment that the pitch has clearly taken this season. Barrow have the first real chance, a header from close range, on the half hour, that scoops over a gaping goal. “Gilt-edged” murmurs an Altrincham fan next to me, quietly checking the numeracy of his blessings. The home side just about shade the first half possession and pressure though, causing a quite gummy old gent somewhere behind me to exclaim “C’mon Alty, we can beat this shower”, before instantly exclaiming it again. Whether this is an appeal for attention, or a short-term memory fault, I am far from sure, but the fact that the shower theme continues repeatedly in the minutes prior to half time may be indicative of a pressing desire to be bathed. 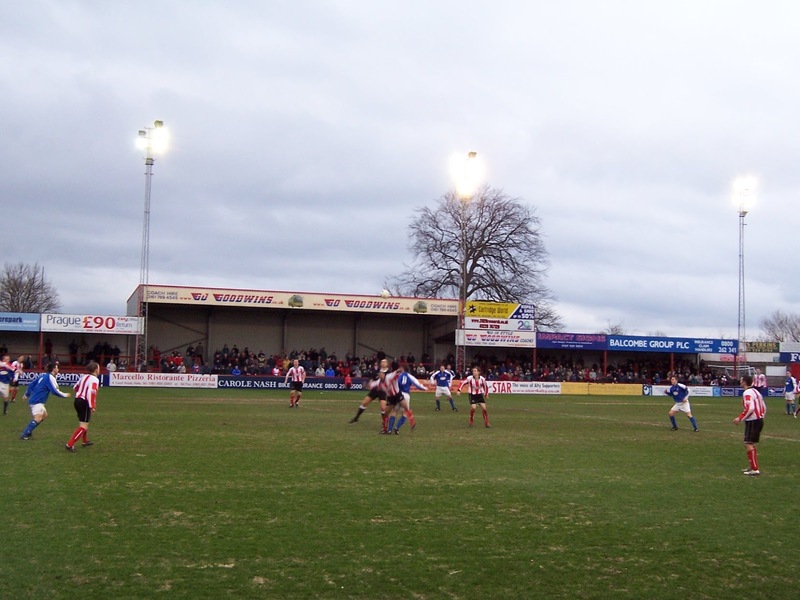 Neither keeper is overly troubled during the course of the game, although Altrincham’s goal sees slightly more of the pressure until the 5th minute of injury time when Altrincham finally steered the golden goal competition away from irrelevancy. The Alty keeper, Stuart Coburn, had been asked by a fan just prior about how a fancied the trip the following Tuesday to Barrow-in-Furness. “I just hope we score now” he replied, as grumpily as he could muster. Moments later he was careering around the pitch as though a starved pitbull were snapping at his heels. Likely to have been contemplating a replay victory for the first three and a half minutes of added time, the Barrow fans’ collective exit was, understandably, slightly less animated.